This week, to celebrate Critical Hit, we are going to be talking about Magmar. It evolves from Magby starting at level 30, and evolves into Magmortar when traded holding a Magmarizer. 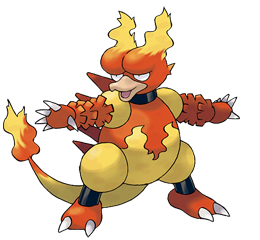 Magmar is a Pokémon with a human-like stance that has traits of a duck and a mythical salamander. Magmar has a red body with a yellow flame design on it. It has a yellow tail that has a flame on it. Magmar has yellow thighs, black legs and red feet with two toes each. Magmar's arms are covered in red, rigid scales and it has red hands with five fingers. Magmar has a row of red spikes running down its back. Magmar has two lumps on its forehead with a flame on top of each one, and a yellow beak. Due to Magmar's tail-flame and partial-reptilian appearance, it has been considered to be a distant cousin of the Charmander-line. Magmar is one of four Pokémon to receive both a pre-evolution and new evolution in generations after its release. The other three are Chansey, Electabuzz, and Roselia.